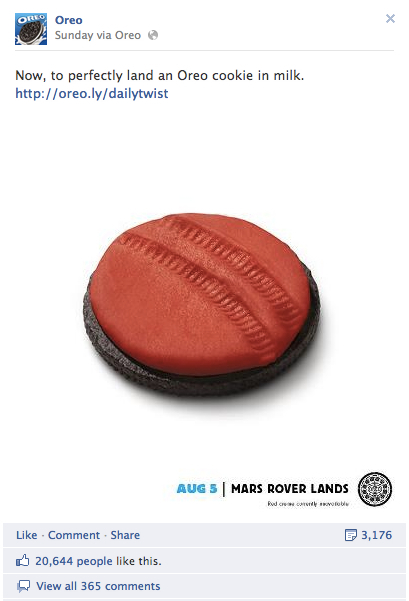 What does an Oreo cookie have to do with the Mars landing? It is part of The Daily Twist marketing campaign – an effort launched by Nabisco-owned Oreo launched in late June to mark the cookie’s 100th birthday. An image of an Oreo will be shared every day for the next 100 days on its Facebook page, a dedicated Tumblr account, and a page on the Nabisco website. This particular image garnered over 20,000 ‘likes’ , 365 comments, and over 3,100 shares on Facebook! Relevant, timely content. That is how you play the social media game! What do you think of their efforts? Previous Post Oops – I’m back!